Note: I've done some swaps to the UK recently and if you're willing to pay the shipping, please inquire and maybe we can work something out. Please check back, I still have some items to post (that are being unpacked and discovered again). Bare Minerals Original SPF25 Mineral Veil (sample size 0.75g)$1.50 (SOLD), Smashbox Photo Finish UVA/UVB SPF15 Foundation Primer (sample size 0.25 fl.oz)$1, Color Club Age of Aquarius Polish (sample size 0.25 fl.oz)$1.50 (SOLD), All samples were purchased by me in either beauty boxes/Skin Kits, and have never been used. 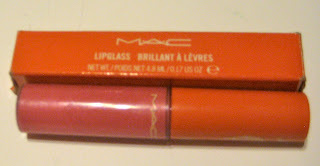 NYC blushable Creme Stick "South St. Seashell", "Big Apple Blush" and "Mauvin' Uptown"
All have been swatched once. $2 each or all 3 for $5. Wet'n'Wild Megalast Lipcolor L-R:C905D "Smokin' Hot Pink", 970 "Purty Persimmon", 919B "Vamp It Up", 902C "Bare It All"-usage shown in pic, 1.50 ea or all 4 for $4. Misc. 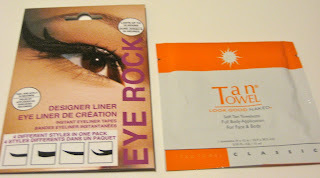 Items: Eye Rock Designer Liner (Contains 4 pairs) $3, Tan Towel Self-Tan Towlette (1 towlette 9x12in) $1. The Body Shop Wise women Softening Toner (Back up BN-never used) $4.50 (SOLD), Fire 'n ' Eyes Costume eyelashes $1, Milani Lip Flash Lip pencil in 03 Flash Light $1.50, Maybelline Coral Lustre Lipstick $3 (SOLD), Ruby Kisses No More Blemishes Foundation. 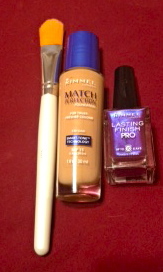 Rimmel Foundation, brush and polish all 3 for $4. 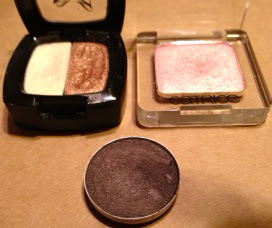 elf Smoky Eye kit $2, Body Shimmer $2 (both Holiday kits).